Welcome to your personal carpet restorer! Oriental rugs are a work of art and deserve a long life. We repair and restore all types of carpets since 1987. According to tradition, the background knowledge and craft skills are passed on to familiy members throughout generations. The first entry into restoration is the analysis of material, chain and color of the carpet. 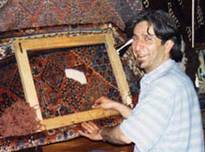 The restorer has to know that the use of color in carpet-making has regional differences , so that a single and uniform image can be achieved. Thus, only materials from sheep and plants from the specific regions of origins will be used. All works will be executed professionally and skillfully in our personal repair shop (former Galery Babylon). The restoration includes cleaning and repair of woven (Kilim), embroidered (Sumak) and linked (hochflor) carpets.